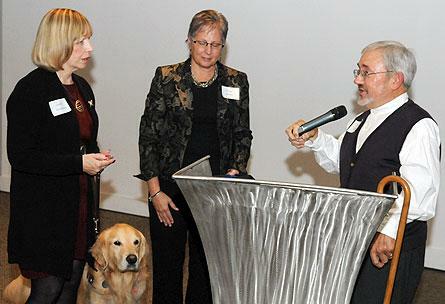 Louise Shumaker, director of disability services at Hope, received the “Ability Award” from the Disability Network/Lakeshore on Tuesday, Oct. 23. The award honors the work of those in the community who persist in the vision of creating communities without barriers for people with disabilities. The presentation, which included a resolution of appreciation from the Michigan Legislature and Governor Rick Snyder, took place during the network’s Ability Award Reception and Ceremony, held at The Baker Lofts. Shumaker has made a career of helping others with disabilities. She has been a member of the Hope staff since 1987, the same year that she graduated from the college with a psychology-sociology composite major. The presentation celebrated her pioneering service at the college on behalf of people with disabilities, noting that establishment of her position at Hope predated the creation of the 1990 Americans with Disabilities Act by three years. The college’s office of disability services offers assistance to all students with disabilities both in the classroom and in day-to-day life on campus, seeking to equip them with skills which will promote independent living after they leave Hope and pursue careers anywhere in the world. Shumaker has mentored more than 500 students with disabilities during her 25 years at Hope. As one reflection of her dedication, following the evening awards event she was returning to campus for a weekly support meeting with a group of students. Among other activities at the college, she has coordinated the annual Disability Awareness Week since initiating the event in 1988. Held during the spring semester, the week features a variety of activities designed to educate about disabilities and accessibility, from invited speakers, to descriptive-video versions of popular films, to the opportunity to participate in disability simulations. Terry DeYoung, who presented Shumaker for the award, noted that the themes in her life of personal and professional development, of advocating for oneself and others, of education and promoting accessibility, parallel her own life experience. Born legally blind, she was in her 30s and a married mother of two when she enrolled at Hope part-time in 1980. It was following her contributions as an intern in the student development office, during which her responsibilities included work on behalf of students with disabilities, that the college invited her to create a more formal program and she joined the staff. In addition to her undergraduate degree from Hope, she holds a master’s in interpersonal and family communication from Western Michigan University. Beyond her work at the college, she has been active in working on behalf of those with disabilities at the local and state level as well. Among other service, she is a past president of the Michigan Commission on Handicapper Higher Education. In 1995, Shumaker received the “State Advocate of the Year” award presented by the Statewide Independent Living Council, the Michigan Commission on Disability Concerns and the Michigan Association of Centers for Independent Living. In 1993, she received the “Michigan State Victory Award” presented by Governor John Engler as part of the national Victory Awards sponsored by the National Rehabilitation Hospital in Washington, D.C. In 1994, at the invitation of the graduating class, she delivered the college’s Commencement address. Dr. Glen Stassen, who is the Lewis B. Smedes Professor of Ethics at Fuller Theological Seminary, will present “A Thicker Jesus is the Basis for Just Peace Making” on Thursday, Nov. 8, at 7:30 p.m. in Winants Auditorium of Graves Hall through the A.J. Muste Memorial Lecture Series at Hope College. Classical guitarist Gideon Whitehead will perform at Hope College on Thursday, Nov. 1, at 7:30 p.m. in Wichers Auditorium of Nykerk Hall of Music.